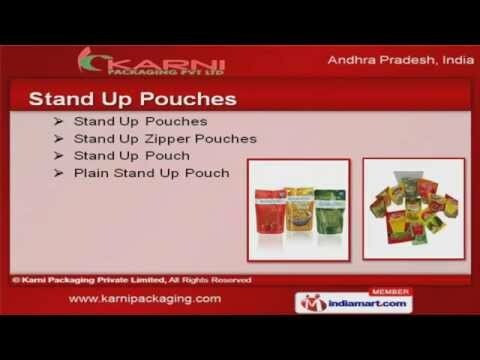 Welcome to Karni Packaging Private Limited Manufacturer & Supplier of Packaging Pouches. The company was incepted in 2005 at Hyderabad. Our ultramodern manufacturing unit & good financial position help us to cater Indian Subcontinent & others countries. Attractive designs, competitive prices & transparent business dealings make us thepreferred supplier in the industry. We offer a wide assortment of Food Packaging, Sealed & Laminated Pouches. Our Food Packaging Pouches are well known for their extreme reliability. Stand Up Pouches offered by us are available at industry leading prices. We also provide Sealed Pouches that are widely acclaimed in the market. Along with that we offer Packaging & Packaging Roll Stocks that are nothing but the best solution for all your needs. Our Laminated Pouches are in huge demand across the global markets.